The answer to the question posed on a sign in the gift shop at Yellowstone’s Old Faithful Inn could well be affirmative for repeat visitors to this iconic lodge. Montana craftsman Rich Holstein fashions wood picture frames from fir flooring circa 1904 and 1936 that was removed during recent renovations. He estimates that pieces of the inn have now made their way to all 50 states and some 20 countries, thanks to his frames. Consider it the ultimate in recycled souvenirs. Although another strong contender is the bison head Christmas ornament crafted from bison dung and decorated with real bison hair. (“What a wonderful way to keep the holidays green!” reads the promotion.) The item is a big hit at Yellowstone’s Lake Lodge Cabins gift shop and elsewhere in the park. 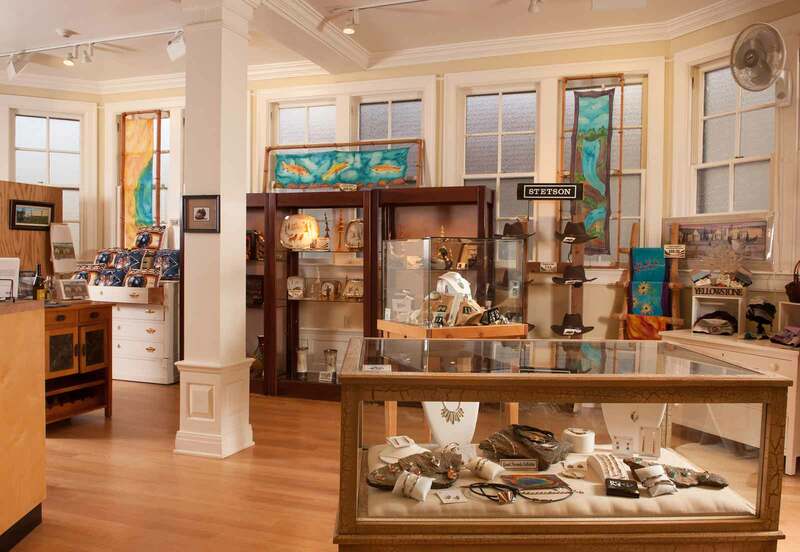 The days of made-in-China items for sale in Yellowstone’s gift shops are long gone, we’ve increasingly focused on carrying U.S.-made and sustainable products as part of our overall goal of sustainable practices. Almost 80% of the inventory our Yellowstone stores is made in the U.S.A. You’ll still find souvenir staples like ball caps, key chains, and shot glasses. “We’re a hospitality company, and we want to give people choices at various price points,” says Dylan Hoffman, Director of Sustainability. But along with the expected trinkets, you’ll find innovative eco-friendly items, like tumblers made from recycled wine bottles. Printed with images of a bear, bison, or elk, the glasses have been a huge seller since they were introduced several years ago. Our buyers also scout local trade shows for homegrown fare. At the Lake Hotel’s gift shop, for instance, you’ll find Montana-made Windrift Hill goat milk soaps and lotions in scents like Grandma’s Raspberry Patch. Artful necklaces and earrings in the Vazza collection, also at the Lake Hotel, feature Montana agate. At the Old Faithful Inn, you can watch artist-in-residence James Reed create his dry brush watercolors on canvas and then purchase one in the shop. And if you didn’t capture your own wildlife close-up during your visit, you can buy an award-winning image taken in the park by photographer Steve Hinch. 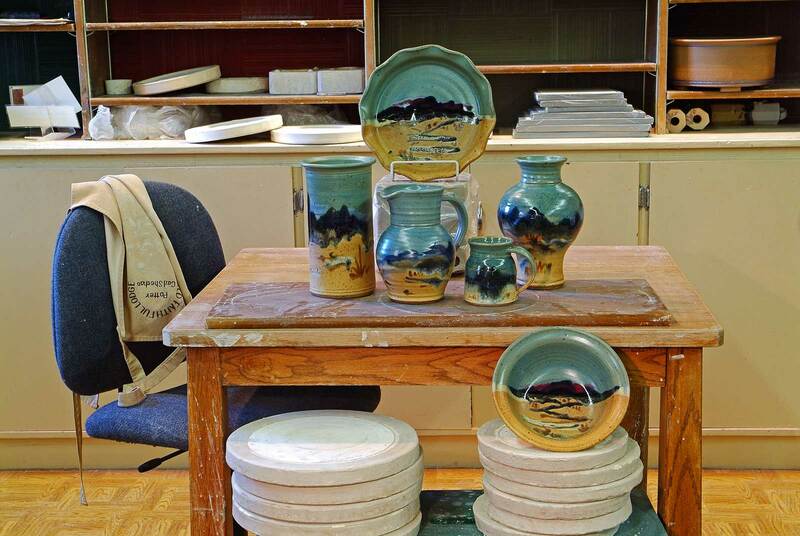 Carl Sheehan’s stoneware pottery adorned with Yellowstone-inspired landscapes is a popular seller in both the Lake Hotel and Old Faithful Inn shops. The former Old Faithful artist-in-residence now runs his Fire Hole Pottery business from nearby Bozeman, Mont. But he still makes monthly appearances at the lodge and figures sales in the park account for 70% of his income. “It’s very important to my business,” he says. We’ve also introduced an educational component to its stores. For instance, informational graphics will be featured in the Mammoth Springs Hotel gift shop when it re-opens in August noting the impact of climate change on various Yellowstone species.